Pin-Up Golf is a company dedicated to professional fundraising for charity golf tournaments. Our mission is to help the charities raise money and provide a fun & memorable day for the golfers. ​Nothing is more important to us than making sure every event we partner with is a successful one. As the innovator and leader in golf tournament hosting, we stand by our core values of integrity, teamwork, quality, professionalism, and exceeding customer expectations. We will continue to strive to serve our community better and more effectively. Our goal is to make a difference in the world with our monetary contributions and our heartfelt service. ​Nothing is more important to us than making sure every event we partner with is a successful one. ​We’ll make sure everyone at your tournament has a Super Fabulous Day and you raise maximum dollars for your cause! Pin-Up Golf ​can help with all your “day of” tournament needs. With our years of experience, we can recommend ways for your group to raise maximum funds and suggest fun new interactive golf games for your on-course activities. We also provide our own quality prizes for our on course games (golf clubs, golf towels, golf balls, golf hats, golf shirts, ball markers, tees, etc). Pin-Up Golf ​provides professional fundraising services for any golf event. We customize our services to fit the individual needs of each event. No tournament is too big or small. Our clients are amazed by our style, class, and fundraising skills. Pin-Up Golf staff make terrific banquet Hosts and Hostesses by helping with live & silent auctions, raffle drawings, and award presentations. Pin-Up Golf ​can help with quality merchandise for your welcome gifts, tee prizes, raffles, and auctions. Because we have been in business over 18 years, we have established wonderful relationships with almost everyone in the golf industry. Pin-Up Golf ​staff members are professional, friendly and fun. We love raising money for charity and pride ourselves in being aggressive without being intrusive. The company is very selective in choosing the staff and it is truly an honor to become a team member. Pin-Up Golf team members are all knowledgeable in golf and are familiar with golf course etiquette and rules – not to mention a few are very good golfers :). 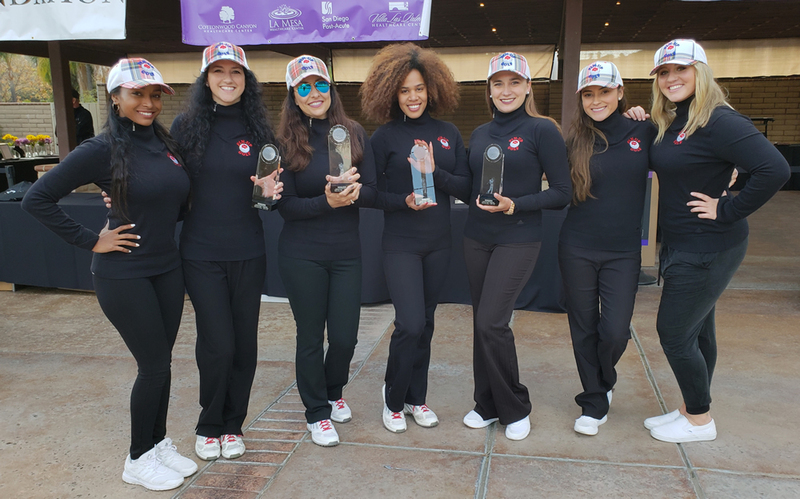 Pin-Up Golf staff are all trained individually by our founder Jennifer Pennington on fundraising, golf course games, and golf tournament organization. Pin-Up Golf is an equal opportunity company and has a co-ed staff. The women’s team uniform is traditional Dress Stewart Scottish plaid kilts, red golf shirts, red golf sweaters, and golf shoes. It is a very traditional golf look. We show up to the event in black slacks and golf shirts in order to set up. It is an option for your event to have us stay in pants if you opt out on our kilts or if weather does not permit kilts. It is also an option for your event to have us wear a tournament or sponsor shirt (as long as it is golf course appropriate). The men’s team uniform is black slacks or shorts (depending on weather conditions), red golf shirts and golf shoes. Pin-Up Golf staff are very dependable and extremely hard workers. Our goal is to make your event a successful one! The corporation is based in Southern California, but “We Love to Travel!”. We also have a branch in Las Vegas, Nevada and are rapidly expanding. To see the publications we have been featured in go to NEWS/MAGAZINES. To see where we have been and our memories from the past go to SCRAPBOOK. To see what others are saying about Pin-Up Golf and our recommendations go to SCORECARD. Thanks for visiting our site and check in with us regularly for new and exciting things.